No discipline is an island. After years of working with patients and researching fetal alcohol spectrum disorders (FASD), Christie Petrenko, a research associate at the University’s Mt. Hope Family Center, knew a mobile app might be just the tool she was missing in order to help families and caregivers of children with FASD. 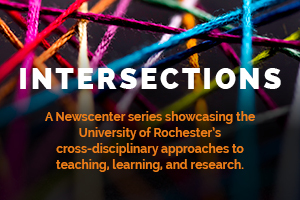 She wasn’t sure who might have the right technical expertise but knew fellow psychology researchers had forged connections with colleagues at the Hajim School of Engineering and Applied Sciences. Soon, she was introduced to Cristiano Tapparello, a research associate in the Department of Electrical and Computer Engineering. A team was born. 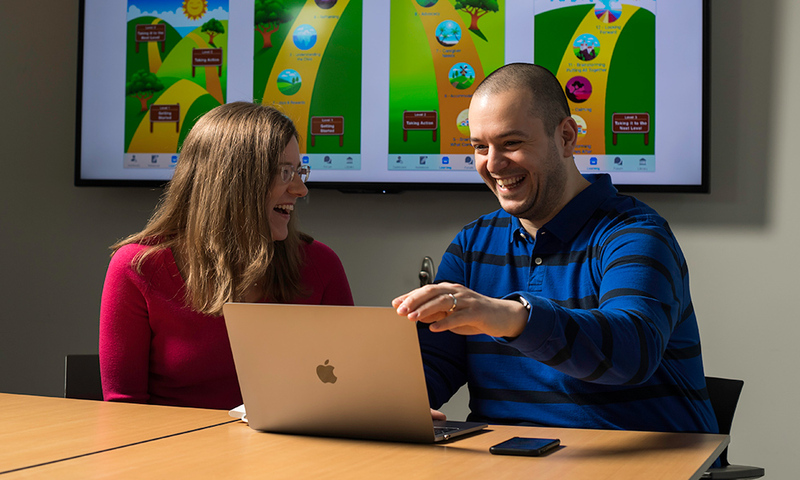 This past summer the newly-formed team were awarded a $1.5 million grant from the National Institutes of Health to develop an app that provides health information for self-directed and peer-to-peer interventions for parents and caregivers of children with FASD. The mobile health intervention will provide scientific, evidence-based content and peer-moderated support that’s easily accessible. Earlier this month, the duo conducted initial focus group meetings with caregivers to show off their first prototypes and get input from those the app is designed to serve. Top of the list for parents: confidentiality, community, the ability to personalize information to their child, and, of course, ease of use. Among other things, parents agreed with the researchers’ idea that the app should contain a caregiver forum to exchange ideas and local resources. The forum needs to feel safe and be moderated so that people can’t make inappropriate comments, they told the researchers. Also, focus group participants said they didn’t want to engage in endless scrolling on their screens to find the pertinent content. A pilot study, conducted by the University of Rochester’s Mt. Hope Family Center, finds that children with FASD who received a specific multi-component intervention showed lower levels of anxiety and modest, but significant, gains in their ability to control emotions better. The biggest change, however, came in the parents’ understanding of their children’s disabilities and their improved ability to respond to their children’s needs. Fetal alcohol spectrum disorders represent a major public health problem, affecting around two to five percent of school-aged children in the United States. The interventions developed by Petrenko and her colleagues at Mt. Hope Family Center are not only acceptable to many families, but can also significantly improve parenting, child behavior, and increase the use of existing resources. Prenatal alcohol exposure is the largest preventable cause of developmental disabilities in the United States. Christie Petrenko has been involved in research and clinical interventions with children with fetal alcohol spectrum disorders (FASD) and their families for nearly 15 years. The app is currently called “FMF Connect.” Its name is derived from the Families Moving Forward (FMF) Program, which was designed specially for children with FASD by co-investigator Heather Carmichael Olson, a clinical professor at the University of Washington and Seattle Children’s Research Institute. Petrenko, a recognized expert in the field, has conducted multiple studies that have resulted in a program of interventions for parents and other caregivers of children with the disorder. The multidisciplinary team now hopes the app will help reduce caregivers’ feelings of isolation while providing reliable, evidence-based health information. At this point, the core content is written and basic design structures are in place, confirms Petrenko. More focus groups throughout the US are planned—in Rochester, Washington D.C., Atlanta, Minneapolis and San Diego—to elicit a wide range of perspectives and feedback. The team is devoting a lot of time to building an interface that looks good and feels intuitive to the user. That’s why they aren’t rushing things. The first two years are earmarked for systematic development to “build a really nice prototype that’s thoughtful, easy to use, and hits just the right mark,” says Petrenko. The app will have learning modules, a library of resources and articles, a peer-moderated family forum, a notebook function for saving comments and ideas, and a dashboard that shows progress through the various learning modules. The researchers are also considering adding a medication tracker function after parents in the focus groups specifically asked for it. Awarded over five years, the grant includes a subcontract with Seattle Children’s Research Institute. The first two years will be spent focusing on the app development. Year three is earmarked for a feasibility trial with 30 families, and years four and five are scheduled for a large-scale test with 120 families in a randomized controlled trial. Co-investigators include Wendi Heinzelman, dean of the Hajim School of Engineering & Applied Sciences; Zhiyao Duan, assistant professor in the Department of Electrical and Computer Engineering; Elizabeth Handley, research associate at Mt. Hope Family Center; Rebecca Van Dyke, a master’s student in computer engineering; project coordinator Jennifer Parr, a master’s student in mental health counseling at the Warner School of Education, and Heather Carmichael Olson with the Seattle Children’s Research Institute and the University of Washington. Those interested in participating in FASD research trials can join a registry through CIFASD at www.nofas.org/cifasd/. « Why do naked mole rats live long, cancer-free lives?